I bought a house in Hawaii in 2014 which had 2 4'x8' solar thermal panels, a 120 gallon solar tank with 1 upper grid tied 4500W element. The previous owners had had multiple problems: leaks, replaced one panel, etc. all of which was disclosed. While it worked, it worked very well providing way more hot water than my wife and I need. But by now, both panels have failed completely. With Hawaii's electric effective rate of about 30 cents/kWh I installed a 6.6kWh photovoltaic (PV) system soon after buying this house. I've closed the rooftop thermal panel water feed and am now using the single 4500W grid tied element for hot water. This does provide plenty of hot water for showering at about 110 degrees F (43 °C) but we would like hotter water for dish washing. Replace the existing solar tank with a hybrid heat pump tanked water heater. These are expensive and new technology without a good track record. Maybe some type of dedicated DC output solar PV system to power a resistive element with grid back up. A couple more notes: First, I have a grandfathered net metering PV system agreement with the local privately owned Hawaii electric company but they have now changed the agreement for new PV customers. They are now backpedaling on net metering as hard as they can! Second, I'm retired and don't have the tax liability I once had, so the solar tax credits mean much less to me. It will take me years to use up the credits from my current PV installation. Well, first of all, it is not typical for panels to completely fail like that. I am guessing that they used an "open loop" system. The typical (and generally better) system is called a "closed loop" system. You can see the basic operation below. An open loop system puts your normal water through the panels. This leads to hard water buildup and corrosion in the panels. 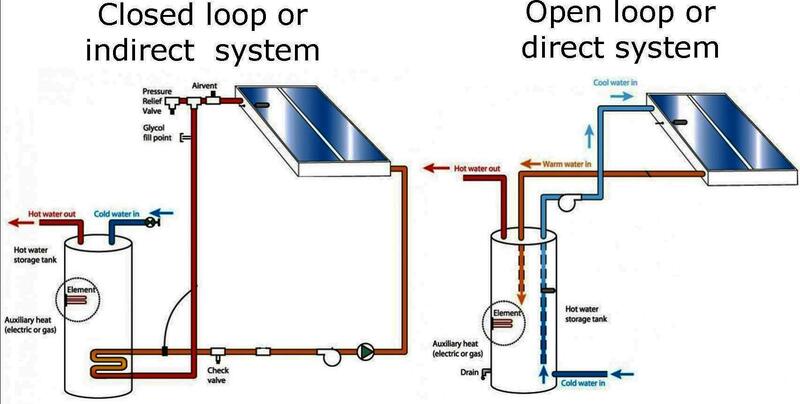 A closed loop system uses a different liquid in the panels and then uses a heat exchanger to transfer the heat it collected. I would assume that it really never freezes where you are, so you would generally just use distilled water in the panels. Here where it freezes hard, we add solar rated glycol to the distilled water. I should cover my tracks here... most contractors may not "go the extra mile" and use distilled water but it is well known that distilled water will corrode less and will not leave any hard water deposits than normal water. Your panels may yet be recoverable. When you say that they both "failed" what do you mean. Are they leaking, clogged, or they just don't really heat? Any of these problems may be repairable under the right circumstances. This will work fine. Just FYI, my best friend (who is a plumber) said that if a normal modern electric water heater lasts 5 years, it is doing very well. He said that they used to be made better but don't expect them to last more than 4 years any more. As you mentioned, this is a risk. These are expensive and they have only been around for a few years. I have heard nothing but good on these and I even have one myself. You want to look at the "energy star factor." Multiply this by 100 and that gives you the % efficiency. (Efficiency above 100% is because you're not really creating heat but just moving it.) For example, Stiebel Eltron currently offers two models, one providing an efficiency factor of 2.75 and the other one at 3.09. That makes efficiency equivalents of 275% and 309% respectively. I am not offering product advice here, just providing an example. These work by transferring heat from the air to the water so they blow out cold air. My guess is that this cool air would be an additional benefit in your climate. This could turn out to be less expensive than option 1 if you add the same amount of solar either way but it is less straightforward. For myself, I would not hesitate to try option 3 but I know that I would be willing to fiddle with it to make sure that the amount of solar connected to the tank would be sufficient. My opinion... As an avid DIYer, I would first make sure that the parts you already have are not resurrectable. Assuming that they aren't recoverable and you have the financing, the second option from your list is the leading technology and the peak of efficiency but the cold air exhaust is not a benefit in cooler climates. Otherwise, your first option is the most foolproof and likely the cheapest upfront. I would only recommend the third option for the adventurous who like to experiment. Using electricity to heat anything is not a good financial decision unless you have abundance. Here, my first solar hot water system failed due to frost freezing the pipes, and the expansion blowing the joints apart. I now have fitted an evacuated glass tube with stainless steel components. It is rated to -15C. During our summer, I have to cover about 80% of the tubes as it will boil the water. For me, replacing the original one with copper collector pipes was a wise decision, plenty of hot water unless we get 5 or 6 days overcast weather in winter. Not the answer you're looking for? Browse other questions tagged solar-thermal or ask your own question.